This page (Lego Atlantis page) is presently under construction so will be developed further over the coming months. 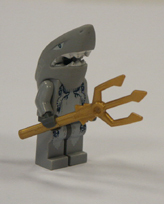 The spare Lego parts for Atlantis sets are also featured and are available for sale on our general Lego pages - i.e. if you are looking for a red brick 2 x 2 dots or 'pegs' simply visit the red bricks page (Page D.), scroll down until you locate the part. Alternatively, you can search for your part by describing it in the description box below, and this may identify the page you are likely to find it on.